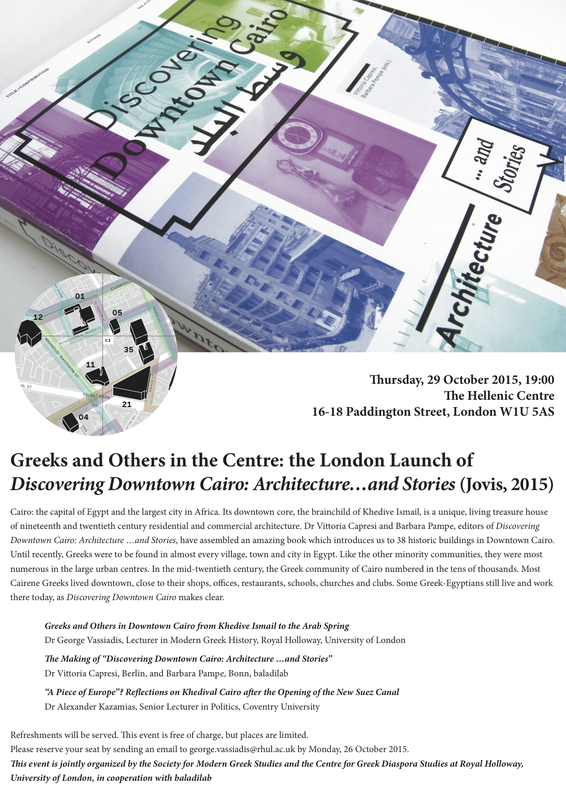 The London Launch of DICOVERING DOWNTOWN CAIRO: ARCHITECTURE …AND STORIES. Cairo: the capital of Egypt and the largest city in Africa. Its downtown core, the brainchild of Khedive Ismail, is a unique, living treasure house of nineteenth and twentieth century residential and commercial architecture. Dr Vittoria Capresi and Barbara Pampe, editors of Discovering Downtown Cairo: Architecture …and Stories, have assembled an amazing book which introduces us to 38 historic buildings in Downtown Cairo. Until recently, Greeks were to be found in almost every village, town and city in Egypt. Like the other minority communities, they were most numerous in the large urban centres. In the mid-twentieth century, the Greek community of Cairo numbered in the tens of thousands. Most Cairene Greeks lived downtown, close to their shops, offices, restaurants, schools, churches and clubs. Some Greek-Egyptians still live and work there today, as Discovering Downtown Cairo makes clear. This event is jointly organized by the Society for Modern Greek Studies and the Centre for Greek Diaspora Studies at Royal Holloway, University of London, in cooperation with baladilab.